Have you ever wondered what it would be like if we went from the digital age to print (the opposite of now)? Imagine the possibilities. The book, Fully Booked: Ink on Paper examines these possibilities. It is a detailed look at what books and printed works have become and will continue to evolve into as we move from boring digital media into the new printed age. Fully Booked: Ink on Paper is a collection of books and other printed products that celebrate the distinctiveness of design, materials, techniques, workmanship, and production methods—and push their limits. Structured into five chapters that each represent a key role that print plays today: The Storyteller, The Showmaster, The Teacher, The Businessman, and The Collector, it showcases publications whose innovative printing and binding befit their unconventional subject matter or radical editorial and design concepts. The tactile experience is as indispensable for the included editors, authors, and designers as it is for their readers. Examples range from personal projects with the smallest print runs to premium artist books or brand publications. Fully Booked: Ink on Paper features work by groundbreaking designers and design studios such as A Practice for Everyday Life, Coralie Bickford-Smith, Irma Boom, Deutsche & Japaner, John Gall, Joost Grootens, Julia Hasting, Heimann und Schwantes, Jung + Wenig, Konst & Teknik, Leftloft, Made Thought, Peter Mendelsund, Niessen & de Vries, Prill Vieceli Cremers, Raffinerie AG, and Studio Laucke Siebein. Its stunning range of visual examples is put into context by texts from Andrew Losowsky, books editor at The Huffington Post. 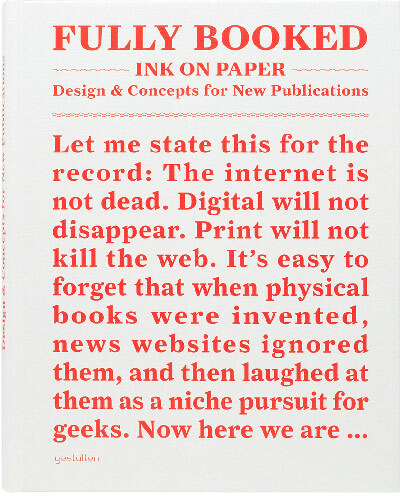 By documenting current experiments and future possibilities for printed publications, Fully Booked: Ink on Paper makes clear that the most exciting phase in the history of printed matter has just begun. A must have for your collection. Fully Booked is coming to the US in April and available at Amazon.